Do you think more people need to know about Glasgow Women’s Library? Do you have a couple of hours to spare about once a month? If so then maybe you can help! Our team of PaperGrrls deliver our leaflets and programmes to other organisations and businesses in the West, East, South and North of Glasgow, therefore helping us to let more people know about what we do and what we can offer women. 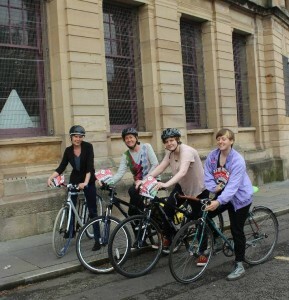 As well as being a great help, the PaperGrrls also get the chance to explore new parts of the city on their bike (or on foot if you prefer) and discover local coffee shops, tea rooms, independent shops and art galleries. You can buddy up with a PaperGrrl who knows the area or head out solo if you prefer. We only ask for a few hours of your time every couple of months. We’ll provide you with maps of the routes, a very special PaperGrrl badge, expenses to cover your travel to GWL to pick up programmes and our eternal gratitude! Please get in touch if you would like to find out more. Or you can complete and return by post or email the Information Sheet which can be downloaded below.